The bank of Canada’s target for the overnight rate went up by .25% this morning, to a total of 1.75%. This has a direct impact on the Prime Lending Rate, which is what Lines of Credit and Variable Rate Mortgages are priced against. Prime is now at 3.95%. What is the “overnight rate”? 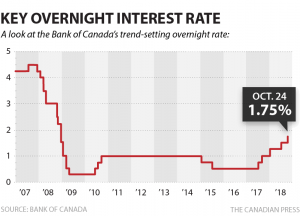 The target for the overnight interest rate is the main tool that the Bank of Canada uses to carry out monetary policy. For this reason it is also commonly called the policy interest rate. It is the rate the Bank of Canada expects other major Banks to use as a guideline (or target) when lending amongst each other. At the end of each day banks must balance their books. If they do not have enough funds they must borrow from other banks. Or if they have a surplus of cash they can loan it out to other banks for a short-term period. These are called one-day (or “overnight”) funds which are transacted during the overnight market. Hence the name “overnight rate”. Changes in the overnight rate affect other interest rates such as Prime, and thereby the rate at which consumers borrow money from the banks, and determine the value of the Canadian dollar in foreign markets. To learn more about the overnight rate check out this article on the bank of Canada’s website. Why has the rate changed? The Bank of Canada monitors spending in several categories in order to determine how to set the target for the overnight rate and thereby influence the rate of inflation. They take into account investment, credit, and other economic growth factors. For example, issues such as increased gas prices in minimum wage previously pushed up the inflation rate. However, the effects of these changes are expected to dissipate early next year. As always, the Bank says they will monitor how the economy responds to increased interest rates in order to keep inflation on target. 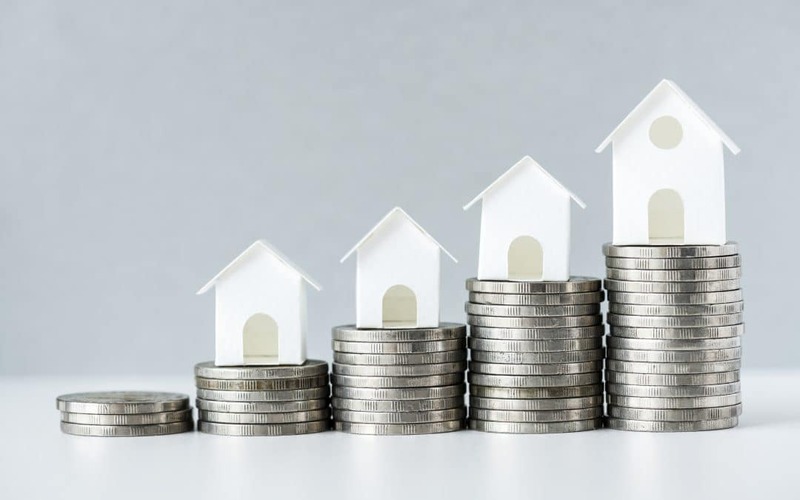 The Bank states that, “Household spending is expected to continue growing at a healthy pace, underpinned by solid employment income growth.” In response to housing market policies and rising interest rates, Canadian are adjusting their spending. Household credit growth is leveling off and housing activity is settling down across the country. Consumers may be coping now but that may not remain true with further interest rate increases. Candice Bangsund, a portfolio manager at investment firm Fiera Capital says the Bank’s statement gives every impression they have confidence in continued growth and stability, which means more rate hikes. “The bank’s constructive and upbeat tone in the statement is not all that surprising given that the economy is operating near full capacity and core inflation is hovering around target, while trade tensions have receded substantially following the successful renegotiation of NAFTA,” she said. However, it is my personal opinion that we are not likely to see very many more increases and we may even see rate drops in the next two years if the Bank continues to be overly aggressive on rate increases (5 hikes in 17 months after a steady rate over two years.) CIBC’s Ian Pollick agrees. “We see them going in October and January and then they’re done. That’s the tightening cycle.” Higher rates have a large impact on indebted households. Recent developments have seen a collapse in Canadian oil prices relative to world prices. And the new USMCA is not an overnight cure-all for present political unrest and trade uncertainties. Only time will tell. But at present, if you are in a variable interest rate mortgage, it may be time to reanalyze if it is the best option for you. Contact me, Josh, today at 403-241-3255.